Safariland 7TS ALS Military Kit Model MIL-KIT FREE SHIPPING! Safariland 7TS™ ALS® Military Kit Model MIL-KIT combines a holster with multiple carry options to meet your needs under a variety of situations. The Safariland Model 7384 Tactical Holster will mount on your leg via a single strap shroud and 568BL paddle, or you can choose the 567BL Injection Molded Belt Loop. 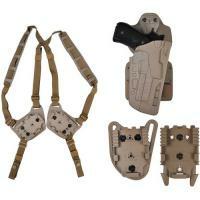 The 7TS ALS kit also includes an MLS 16 chest mount MOLLE Locking Fork and a shoulder harness. All components feature the QLS 22 Quick Locking System Receiver Plate. Safariland offers this kit in your choice of black or earth brown colors. ©2002-2019 CopsPlus.com: Safariland 7TS ALS Military Kit Model MIL-KIT FREE SHIPPING!